Somporn Vongvuthipornchai, President and Chief Executive Officer of PTT Exploration and Production Public Company Limited (PTTEP) together with partners in the Vietnam Block B & 48/95 and Block 52/97 project in Vietnam signed the Letter of Agreement of the Wellhead Gas Price and Transportation Tariff of the project. The agreement will enable the finalization of relevant commercial agreements across the gas value chain. Photo shows (from left): Dr. Nguyen Tien Long, Vice President of Petrovietnam Exploration Production Corporation (PVEP); Mr. Mitsuo Hidaka, President and Chief Executive Officer of Mitsui Oil Exploration Company Limited (MOECO); Mr. Nguyen Vu Truong Son, Acting Chairman of the Board of Directors, and President and CEO of Petrovietnam; Mr. Nguyen Sinh Khang, Vice President of Petrovietnam (PVN); and Mr. Somporn are signing the Letter of Agreement. The achievement marks a significant milestone towards making a Final Investment Decision of the project. 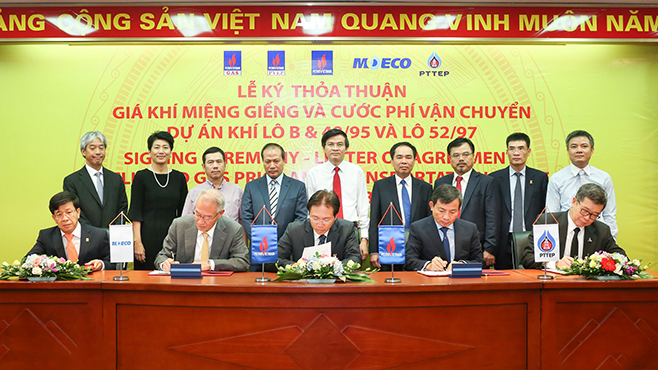 The signing ceremony was held in Hanoi, Vietnam.